Take vintage compositions, mix with a few stars of today, and you’ll get a delicacy for the ears. 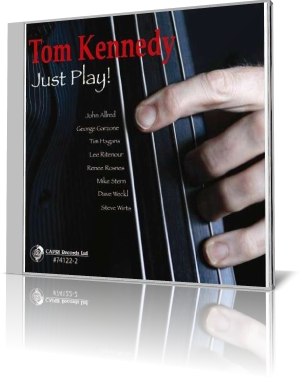 Bassist Tom Kennedy accomplishes this with Just Play (Capri Records, 2013). Kennedy delivers fresh interpretations of songs composed by Sonny Rollins, Victor Young, Lee Morgan (the review copy incorrectly credits Freddie Hubbard with “Ceora”), Duke Ellington, Cedar Walton, Dave Brubeck and Cole Porter. For this outing, Kennedy calls upon the talents of Dave Weckl, drums; Renee Rosnes, piano; George Garzone, tenor sax; Mike Stern, guitar; Tim Hagans, trumpet; Lee Ritenour, guitar; John Allred, trombone; and Steve Wirts, tenor sax. Kennedy plays acoustic bass. The Rollins classic “Airegin” opens the set. Though a mid-sized ensemble, Kennedy and friends play it with all the verve of a big band. Garzone makes the tenor wail during his solo, and Rosnes licks her chops. The leader isn’t content to stand back and watch. Kennedy gets quite busy underneath the leads, as does Weckl. Of course, the bass gets its moment to shine as well. Stern composed the one original song, “One Liners.” His distinctive guitar voice blends well with one of the tenors. The song is more fusion than classic, but still fits well with the overall concept. The other horns sit this one out as the smaller lineup cranks up the heat. Kennedy has recorded or performed with a range of artists, including Michael Brecker with Steps Ahead, Al DiMeola, Mike Stern, David Sanborn, Joe Sample and Lee Ritenour. Recorded in one day at Nola Studios in New York City, Just Play is like a structured jam session. Many of the songs were recorded in one take. Kennedy dedicates the recording to his brother, Ray, who has multiple sclerosis.